Welcome to Angel the cat. My name is Karen and this is my cat. My favorite food - Anything in a can...but I also feed her dry food to help cut down on the fur balls. This is what I like to do the best - Angel loves being in the middle of anything I'm doing. When I'm on the computer, she enjoys standing in front of the screen. Or sleeping on the manuscript in the middle of my desk. When I'm wrapping a gift, she is chewing on the stringy ribbon or scratching at the paper. My funny habits are - She is VERY vocal. In the morning she climbs up on me. I usually sleep on my side and she scales me like a moutain until she reaches my face. Then she lovingly rubs her face against mine. Like a mother cat does to her young. Sometimes it's as early as 5:00! But she always manages to get a smile out of me...that in itself is a miracle. This is one of my favourite cat photos of Angel. My cat adopted me at the Animal Shelter. It was love at first sight. Angel our sweet Tuxedo cat has truly been an angel to us. She was a housewarming gift from a dear friend who came to visit. I had been praying for a solution to a little mouse problem. Without my friend knowing about the mice, she suggested we get a cat. The first time I saw Angel she was in a little quilted box at the Animal Shelter. Only her eyes were peeking out. We took her into a special room and she loved up against me and my husband, licking his hand. She was the one! 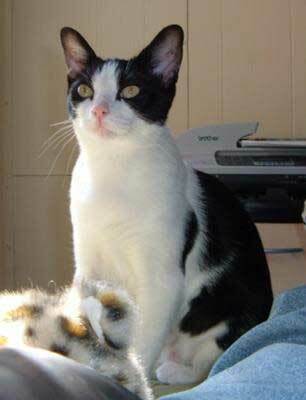 We found out that she was not a kitten, but a mother of six! having delivered her litter the previous month. I didn't care that she was an older cat...I think she was probably one of the youngest mothers as she has grown so much in the past nine months. The first night with us was the hardest...I wondered if I hadn't made a mistake. We were told to keep her in a small room and not to feed her or give her water as she was neutered earlier that day. Then to make matters worse, she had to wear one of those awful collars that looks like a megaphone. Well, she would have none of that! Did I mention that her name at the Shelter was Bumble Bee. She didn't stay in that thing very long. I felt so bad as she cried and tried to open the laundry room door. I went in to be with her, but she cried even more. I brought her and her litter pan into our room hoping she would quiet down...but that didn't work either. Finally, I gave in and gave her a little bit of dry food and a taste of water. That did it! After her treat, she slept up on our bed by my head. She slept there for the next few nights...until she felt at home enough to nestle at our feet. Angel the cat is part Siamese. You can see it in her face, but not her coloring. I love her sweet little pink nose and light green eyes. She is vocal, too. Everytime she finds something moving, usually in the middle of the night, she makes a loud MEOW...wanting us to take a look at her prize. She did find one mouse. Must say, we let the little guy go, but since then we have been mouse free. The love of a furry one has a way of wiggling into the little nooks and crannies of one's heart...and melting away the hard spots. Thank you, Angel for bringing us joy. Who can be grumpy when awakened each morning with a purr, a face rub, and a loving nose lick. Angel the cat loves to scratch and claw the wicker night stand. Mama was shopping at K-Mart when Papa pointed out a Super Scratcher box! Only five bucks, they bought it. When they got home, it was just a hunk of cardboard. Mama felt dupped, but they put it on the wicker night-stand. No way was I scratching that thing. It was going in the trash until a light bulb went off in Mama's head (weeks later, duh!) She put it on the floor. 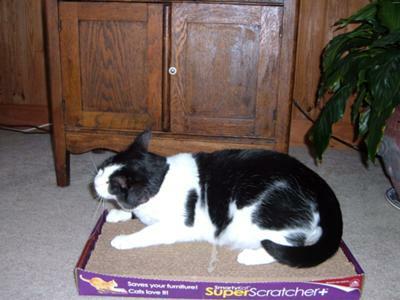 When I clawed at the nightstand, she put me on the Super Scratcher and moved my paws.